I just received an email with 25 practical ideas for a coffee filter, so I thought I’d share them with you. 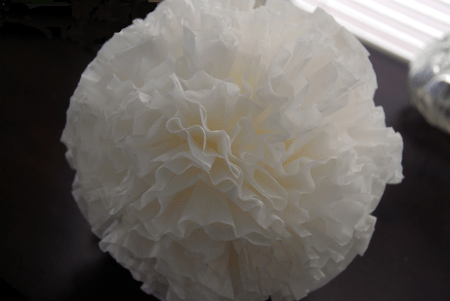 Then when I was looking for a photo of a basic coffee filter, I came across some awesome coffee filter craft ideas. I’ll share 5 of the best of them as well. Coffee filters …. Who knew! And you can buy 1,000 at the Dollar Tree for almost nothing even the large ones. 2. Clean windows, mirrors, and chrome… Coffee filters are lint-free so they’ll leave windows sparkling. 19. Use them as a spoon rest while cooking and clean up small counter spills. 20. Can use to hold dry ingredients when baking or when cutting a piece of fruit or veggies.. Saves on having extra bowls to wash.
22. Use them to remove fingernail polish when out of cotton balls. 23. Use them to sprout seeds.. Simply dampen the coffee filter, place seeds inside, fold it and place it into a plastic baggie until they sprout. 25. Use as a disposable “snack bowl” for popcorn, chips, etc.